New underground technology represents a real breakthrough: an attractive cityscape, livable environment, safe public spaces. Vandalism-proof solutions: no risk of accidents, no graffiti, no posters. Secure power supply. Operates even after rainfall. Guaranteed internet and cable TV access. 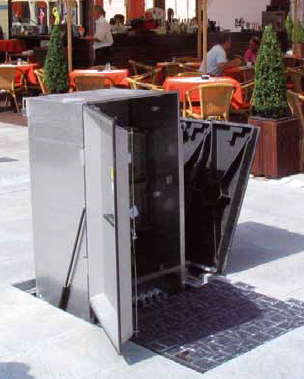 Installation in any pavement, without hampering the up keeping of public spaces. City utility vehicles can roll over it.